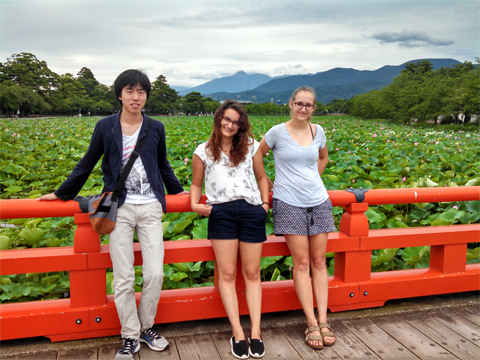 From left, Reiju Nemoto, Claire Seid and Abby Stephens in Japan. 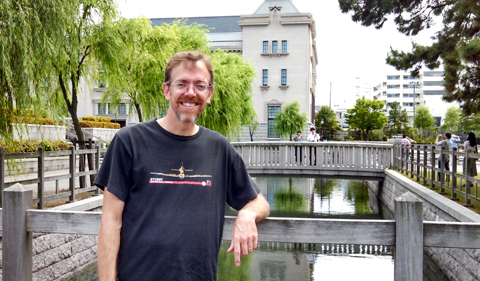 In 1998, Dr. Charlie Morgan, Assistant Professor of Sociology, made his first sojourn to Joetsu Niigata, Japan, to study and interview international couples. This summer, three Ohio University undergrads went along—in part to help interview the couple’s teenage children. In addition to getting undergraduate research and field experience, they discovered friendship, biking, and Dandy bars. At the time Morgan began his research, he was a university student himself, and he was writing his master’s thesis on immigration in Japan through the eyes of international couples. Three years ago, he decided to track down the people that he had spoken with 15 years ago. Dr. Charlie Morgan in Japan in 2014. “Every summer I go to Japan, and I’ve been re interviewing [these couples],” he says. “And then expanding beyond that as well. This summer we decided we wanted to [interview] the children of these international couples: the second generation.” Morgan says he thought it would be nice to have some students on the trip this time—in order to give the now teenage interviewees someone closer to them in age to talk to. That’s when several outstanding Ohio University students come into play. “This seemed like a super great opportunity to do research in the field with a real sociologist,” says Claire Seid, a junior Honors Tutorial College sociology major. She got interested in the trip because she was working on a sociology research methods tutorial with Morgan at the time. Abby Stephens, also a junior HTC sociology major, says she got interested in going on the trip during a conversation with Morgan, who is her adviser. “We just got talking… and he told me more about his research. I’ve always been interested in Japan and Japanese culture, so that’s pretty much why,” she says, adding as she looks at the student to her right, “also to bother Reiju.” They all chuckle. “We’ve been doing this research for about a year now before we went on the trip,” says Reiju Nemoto, a senior civil engineering major. “I’ve been transcribing all these interviews… from 1998 and some from 2013.” Nemoto is an especially crucial member of this research team as one of the only undergrads at OHIO who is bilingual in English and Japanese. He has been transcribing the Japanese interviews for Morgan. “He was literally the only guy on campus that could do this job,” Morgan says. The gears have been turning on this trip for over a year now. In order to prepare, Stephens says they did a lot of literature review on Morgan’s previous work. “We would listen to it and analyze it,” adds Nemoto. Both of them also helped Morgan with writing a paper on the previous interviews. In order to fund the trip, Seid and Stephens applied for the Student Enhancement Award through the university. The application required their submission of a mini literature review, the purpose of their trip, a budget, and an estimated timeline of when their findings would be published. “It really wasn’t that difficult for the amount that we received,” Stephens says. The award covered airfare, food, and most of their lodging. Morgan covered the rest with his Baker award, which he received from the university two years prior and has been using to pay Stephens, Nemoto, and Seid for their work writing papers and transcribing. “[The university] encourages something like this because it’s usually grad students that win these student enhancement awards, so for undergrads to be able to go and do research, I think they’re really excited,” Morgan says. Morgan and the students spent 17 days total in the field—and got to do some sightseeing. Over the course of the trip, they conducted 24 in-depth interviews: some as a group and some separately and simultaneously. “By and large… the kids seemed to be pretty adjusted,” Seid says. Morgan and the students spent their days of fieldwork in the small city of Joetsu. “[Joestu is] a nice micro-chasm of how immigration looks overall in Japan because you have the rural aspect and the Western [influences], so you get a little bit of everything,” Morgan says. As for lodging, Seid and Stephens got the experience of staying with host families and fully immersing themselves in Japanese culture. “I wanted them to stay with host families so they could get a feel of what Japanese life is like,” Morgan says. Since the area of Japan in which they were staying was so rural, “we couldn’t depend on buses or trains, and renting a car was way too expensive, so we just biked all over the place,” Morgan says. 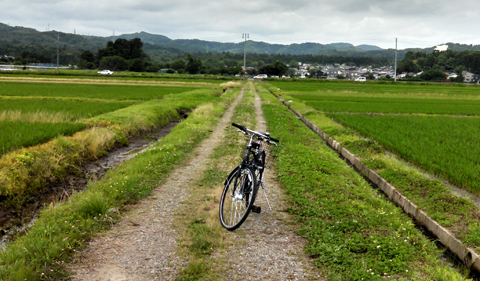 Dr. Charlie Morgan’s bike in Japan in 2014. “I looked at the map and the weather, and I didn’t go. It was 103 that day… 90 percent humidity,” responds Nemoto. “It sounds like a novel day, but it was still really fun,” Stephens reassures. When asked about any moments of culture shock, Seid told the story of when she first landed in Japan and went on the hunt for a vegetarian dinner. “I first had to identify which shops had food in them. That was surprisingly hard! Then I had to identify what kind of food it was, and then I had to see if it had meat in it. That was really hard, so I ended up eating salmon sashimi, which is raw salmon and rice. Not exactly what I wanted, but it was tasty,” she says. Everyone perks up at the mention of this frozen treat. “The best ice cream bars that you’ve ever even imagined!” Seid gushes. “Honestly, I’m kind of sad to be back in America knowing that that’s out in the world now,” Stephens adds. Even though Nemoto is Japanese, he found this particular community to be different from what what he’s used to. “Even though I can read Japanese and function in Japanese society … the thing about small towns that I have trouble with in Japan [is that] the stores there don’t have the times or the hours scheduled anywhere. In the town we were in, Wednesday is their break day, not Sunday. I was trying to go shopping and I was like, ‘everything’s closed!’” he adds. Seid and Stephens are working on transcribing the English interviews from the trip and writing a paper about the second-generation children they interviewed. Morgan and Nemoto are working on a paper together on the couples. They are currently waiting to hear if one of their previous papers has been accepted for publication. The team hopes to submit papers to more publications and to present at the American Sociological Association annual meeting next August. According to Morgan, having the experience of being published and presenting papers is a unique and beneficial experience. “I think it makes [you] a much stronger applicant for law school. This is something you put on your resume to say you’ve done research,” he says. “People don’t really get publication and this much research experience in undergrad,” Seid adds. For any undergrads out there who are looking to get this kind of research experience, there are more opportunities at Ohio University than meets the eye if you know where to look. “Even if it’s not your field of study,” adds Nemoto.